Jenkins’ most performed work - included in our season again by popular demand - incorporates every style and mood in a courageous examination of war and peace expressed in bold and vivid manner. Fauré’s Requiem, serenely beautiful and moving, makes for a very special partnership. A celebration in words and music, including carols for all to sing, with some special repertoire appropriate to this First Wolrd War Centenary Commemoration year. 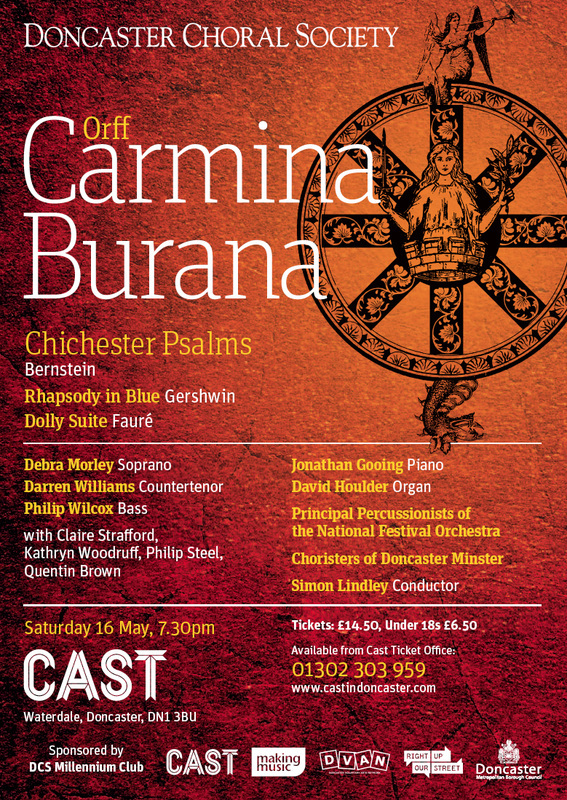 Carmina Burana is one of the most popular pieces in the repertoire, full of vigour, life, humour and luscious harmonies. The appealing simplicity and beautiful melodies of the Chichester Psalms’ make this one of Bernstein’s most approachable and exhilarating scores - and one that continues to focus on praying for peace in Jerusalem. International Tenor Ben Thapa brings a Garland of English Song to Doncaster Choral Society’s Spring Concert. As preludial music to the two major works of the evening – Vaughan Williams’s Don nobis pacem of 1936 and Samuel Coleridge Taylor’s Hiawatha’s Wedding Feast of 1898. Ben is a regular and esteemed guest at Doncaster concerts and we are delighted that he has agreed to present and sing a glorious galaxy of exquisite English music from the 17th century onwards. Henry Purcell, Michael Head and Peter Warlock will be heard at the opening of the concert, unfolding from Purcell’s evocative “Music for a While”. The Society’s conductor, Dr Simon Lindley, will accompany Ben on the piano. including some from their famous recordings on the Chandos label. This mass is based on the 15th-century French song L'Homme Armé (The Armed Man). The complete work sets sacred and secular texts including Tennyson, Kipling, The Koran and the Hindu Mahàbharàta within the framework of the Christian mass. "When I started composing The Armed Man, the tragedy of Kosovo unfolded. MESSIAH Handelplease note earlier start time at 7.00pm a complete performance–"cover to cover"
sponsored by the DCS Millennium Club. For latest news and information about the choir, check out this website and follow us on facebook where you will find extra links, photos and where you can leave comments. Haydn's CREATIONThe pre-eminent choral masterpiece of Haydn's compositional "Indian Summer", The Creation combines immense lyricism with dramatic, illustrative music of huge impact. The 'Requiem' combines many of the traditional stanzas of the latin 'Mass for the Dead' with glorious English texts from the 'Book of Common Prayer' in music that encourages as well as uplifts. 'Feel the Spirit', another firm favourite with choirs and audiences, brings special magic, new life even, to such well-loved titles as 'Steal Away' and 'Deep River'. Challenging and inspiring as well as dramatic and dynamic, St John is probably Bach's most vivid work. An open invitation is extended to all who would like to join us rehearse and perform this wonderful work. Guest Artiste Margaret McDonaldAnother opportunity to hear the excellent Margaret McDonald and the Society in a feast of praise including music by Handel, Haydn, Parry and Stanford. GLORIA VivaldiThe season opens with Rutter’s Magnificat, inspired by JS Bach’s masterpiece and like Vivaldi’s Gloria is bright and full of energetic, strong rhythms and melodies. style explains why this work is so popular. and sing this wonderful work. *FREE Choral Music practise files (SATB) can be found on the internet to help with rehearsals - follow the links, then just listen to your parts as they are played on your PC or MAC - as at choir for help if you need it. MUSICK’S JUBILEE CarterST NICOLAS BrittenThe season opens with Britten's highly evocative and moving cantata and Andrew Carter's joyful and approachable Musik's Jubilee. GERMAN REQUIEM BrahmsA warm favourite for may people with music of great beauty. An open invitation is extended to all who would like to join us to rehearse ad sing this wonderful work. GloriaRutterRenaissance Music for Voices & BrassMotets by Schutz, Viadana & Palestrina together with music for organ and for brass. The Minster offers opportunities for the kind of spatial effects suitable for music of this period. Two new works to the Society. The St. John Passion is an early work, which according to some sources Handel didn't write at all. The Ways of Zion was the original Part I of Israel in Egypt. It contains some of Handel's finest choral music. Rutter's Requiem is a popular favourite while Palestrina's Missa Brevis provides an opportunity for special effects and a semi-chorus. Choral Workshopwith Keith Orrell, chorus master of the Halle Choir . 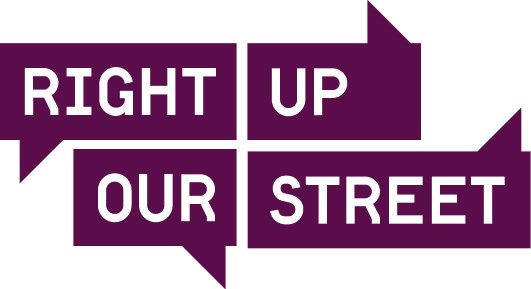 LOGO DESIGNED BY MICHAEL SHAW OF DON. ART COLLEGE, CONSISTING OF 2 'D's one being reversed, both inclined, to represent the opening up of the Doncaster District to encompass a great future in Music.